This game was invented by Charles Titus and Craige Schensted. 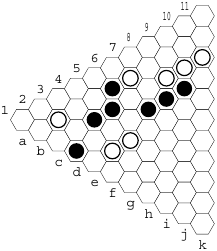 It is a connection game inspired on Hex, but where the goal is to connect all three edges. 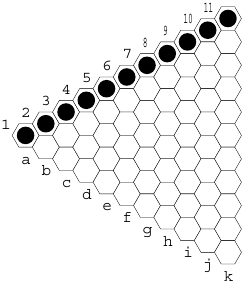 A triangular board with eleven hexagons per side, 30 white and 30 black stones. Group — a connected group of pieces of the same color. Y — a group that connects all three edges. 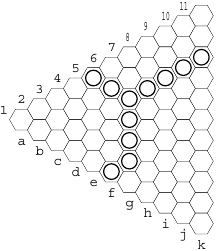 On each turn, each player drops a friendly stone on an empty hexagon. After the ﬁrst drop, the second player has the option to swap colors (i.e., he becomes the ﬁrst player, and the adversary continues the game as the second player). The player that achieves a Y wins the game. The next example shows an endgame, where Black has a deﬁnitive advantage, regardless who is next. Any White attack can be neutralized. For example, if White drops a stone at d2, Black replies e2, making his virtual connection into an eﬀective connection. The main strategy, like in most connection games, consists in keeping as many connective options as possible, preventing the adversary from doing the same. 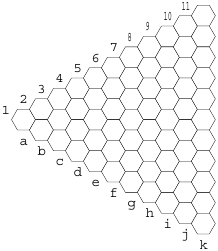 Most of what was said about Hex can be said about Y. A nice variant is to apply the progressive mutator to Y. So, the ﬁrst player in the ﬁrst turn makes one drop, then the second player makes two drops, then three, four… There is, however, a restriction to prevent the game from becoming trivial: no two stones dropped in the same turn can belong to the same group! The next diagram shows the ﬁrst four moves on a progressive Y game. Black started. In the second turn, White plays already four stones. Stones h2 and j4 create a double connecting threat with h4. Black cannot stop both in the same turn (that is, playing in h3 and i4) because these two stones would belong to the same group. After the fourth black move, it is already noticeable his positional advantage.